Barrie Colts fans are the BEST! Quiet, but the best! #OHL - Very Barrie Colts | A website covering the Barrie Colts of the OHL. What is home ice advantage? Lets take a look. The home team has the the benefit of having the last line change. How is this an advantage? Well, the home team gets the opportunity to send out their players AFTER the visiting team. This is pretty big because it allows coaches to match lines. This can be a big advantage. The final advantage to home ice is, well, being at home. YOU ARE THE ADVANTAGE! I mean, how great is it to have your fans supporting you? Cheering you on when you are leading, screaming your name when you are down with hopes of getting back in the game. I am sure that the players love hearing chants of support. They love hearing you. So, why are you so quiet during play, Barrie? Don't get me wrong! 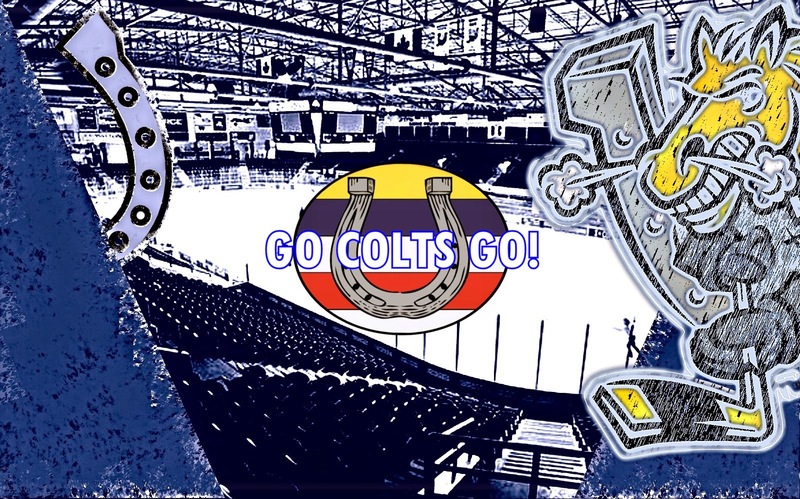 While running this blog, it has been a great opportunity for me as a fan of the team to interact with other Barrie Colts fans and having lived in other OHL markets like Oshawa, Peterborough and Belleville I can say Barrie fans are as supportive and passionate as any around the OHL. We love our team. We pack BMC and wear our jerseys in support. Colts fans know the team, the sport and are just GREAT. BUT, we are mostly quiet.. Why? Why are North Bay fans drowning us out in our own arena? Lets see if we can trigger what causes this issue. Here are a few theories we have seen. @VeryBarrieColts I've always said it's the music played. Doesn't exactly get you pumped up for the game. Wait, you don't get pumped by "What does the fox say"? Okay, so maybe its just the kids that get pumped. And you know what, that is great! Kids are a huge part of OHL hockey. What better way to spend a night than to take the family to some cheap and really entertaining hockey! And how great is it to see the kids dance? BUT, songs like this (and there are many played at BMC) don't help the "mature" audience. So maybe they need to consider playing the songs that keep kids happy but incorporate music that older generations would enjoy that would get them pumped up. Is it just a matter of just adding more variety to the song rotation? @VeryBarrieColts timing of the song is important too. Sometimes there will be a great shift with lots of energy, and then play a slow song. A great point. Is it just me or does it seem that there is just a rotation of songs that gets played. The same songs, similar order, every night? Maybe if there were a variety of songs different order.. It would make games feel less "routine oriented". Maybe when the team needs a goal if a high energy song is played it could get fans going more which in turn could help the team score a much needed goal. What if we told you that other fan bases refer to BMC as "The Library". I mean, can we blame them for that? A handful of North Bay fans drowned out the arena full of Colts fans. Is that nickname really unfair? Wait, that was a loud crowd. So we CAN make noise. And we do. When our team scores the building erupts. That isn't the only time. When the "Noise Meter" is on the screen, fans usually are loud. Also, giveaways. People love the chance at winning stuff. But we need a way to get the fans going during play as well. We do have the passion and the willingness to make noise, we just need to find a way to get fans cheering more during play. You do hear fans. One end you will hear a "Go Colts Go" chant but it dies out because nobody wants to yell by themselves. When you hear someone start a chant we NEED to support them because they are supporting our team. If you hear someone chanting be sure to join them because if you do, someone else might join in and it will only grow from there. Remember, fan support isn't just about supporting your team but it is also about supporting one another. Don't be shy, we are all there for the same cause. GO COLTS GO! Change the music. As mentioned earlier, a great way to get people pumped is with music. Music they enjoy. We need to keep playing songs that get kids pumped and incorporate music that gets the older fans into the game as well. Also, mixing up these tracks and strategically placing songs in places with hopes of getting people going. If the team is down, a high energy track might help get fans going which in turn could motivate the team more in the game. Utilize Charlie Horse. No doubt the kids and fans love him, and they should! Even I get excited to see him when he walks down my aisle and have to fight myself from asking for a picture with him. And yes, I am 31.. But is there a way to have him get fans going more during games? Here is a suggestion. The Pittsburgh Penguins mascot 'Iceburgh' is another great hockey mascot who gets his teams crowd going but it can be tough to get an arena full of people cheering when he is limited to one section of the arena. What the Penguins mascot does is during play when the team is in need of fan support, Iceburgh will blow one of those loud horns 3 times and when that is done fans will chant "Lets go Pens" and it ALWAYS works. And it will go on back and forth between the horn and fans multiple times. If the Colts could utilize a similar approach with Charlie he could do this to help get some noise from the Barrie crowd. Try props. Towels are a simple and cheap way to get fans more excited. You get fans spinning towels over their heads you can't help but make noise. You are visually and audibly supporting your team. These are just a few suggestions. Again, I don't think there are many fans as passionate as Colts fans but the team and us as fans need to find a way to get behind our team. Lets make sure that we give them the full benefit of home ice advantage. So WE CHALLENGE YOU, COLTS FANS! Saturday is Game 5 and the series will be back at BMC. Bring Towels, bring noise makers and bring your voice because I want to hear you! And so does the team! Do you have any thoughts on the quietness or suggestions as to how we can become a louder fanbase? Let us know in the comments, on Twitter or our Facebook page. You need more beer. North Bay's arena is very loud, mostly because of the substantial beer sales. Last year, prior to the East & OHL finals, there was even tailgating outside Memorial Gardens which really helped get the crowd loud. If Barrie can just get 100-150 really inebriated fans, your arena will be rocking. I've gone to many, many college football games and and its the booze that makes college football crowds so boisterous. In the words of Homer Simpson “Here’s to alcohol: the cause of, and solution to, all of life’s problems.” It would certainly fix your problem. This could possibly help but I find in comparison to other OHL markets I have been in there are a lot of kids. No doubt that alcohol could help get people more vocal but maybe not for the right reason. There needs to be a way to get fans more excited without beer. But I do like you thinking and you are making suggestions! Also I don't doubt that the concession at BMC would LOVE your "people should buy more beer" idea! Thanks for the comment!